Origin and Habitat: Chubut, Península Valdés, Argentina. Altitude: From near sea level to about 400 metres above sea level. Habitat: It grows among scrubs and stones. Península Valdés has a semi-arid climate characterized by an annual rainfall of 240 millimetres (mm) with significant fluctuations between years and features a peculiar climate because of the effect created by the Atlantic Ocean. During winter there are heavy snows and frosts can occur throughout the year; spring and autumn provide only short transitions between summer and winter. Although it does not rain much in the region on an annual basis, summers are usually mild, and the temperature sometimes gets very hot. The area does get very windy at times. The area of the Peninsula Valdes harbour an interesting succulent flora comprising Austrocactus patagonicus, Maihuenia patagonica and Tephrocactus darwinii. 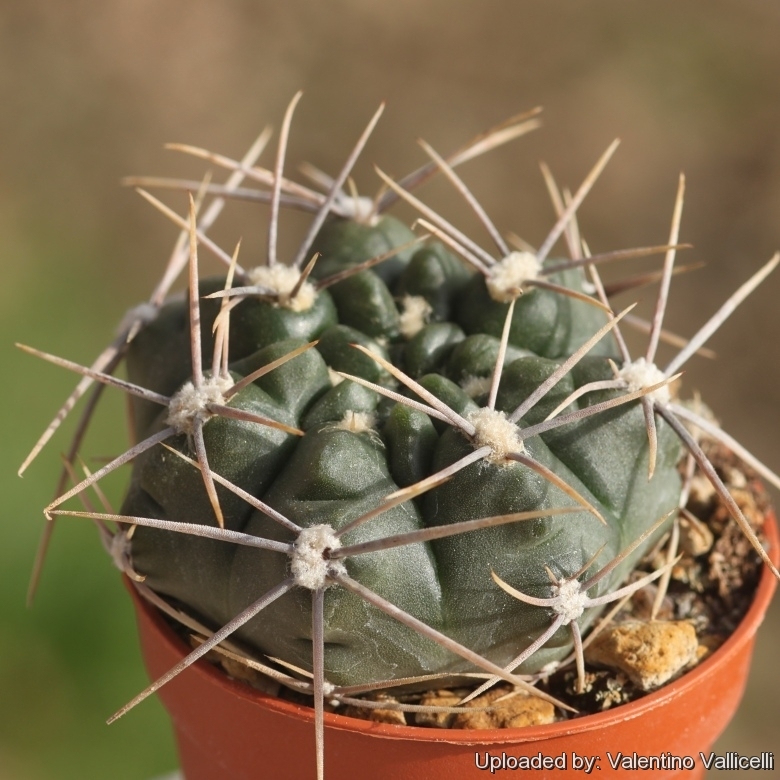 Description: Gymnocalycium gibbosum subs. ferox (Labour. ex Rümpler) Papsch is a local or morphological form of the very variable Gymnocalycium gibbosum that, as the name states, is characterized by very robust, ferocious white/brownish radial spines and usually no centrals. Moreover it has more slender, 4 angled tubercles. It is often considered just a spinier form of Gymnocalycium gibbosum v. chubutense because the two species or populations exist in the same geographic area and thus regularly encounter one another. It is also similar to Gymnocalycium gibbosum var. nobile. Radial spines: 5-7 (-9) 20-65 mm long slightly bent against the plants body, whitish to clear brown with a darker base when young, becoming whitish-grey with a black base as they age. Central spines: Usually absent or if any very similar to the radials. Cultivation and Propagation: Gymnocalycium gibbosum subs. ferox is a summer grower species that is easy to cultivate.